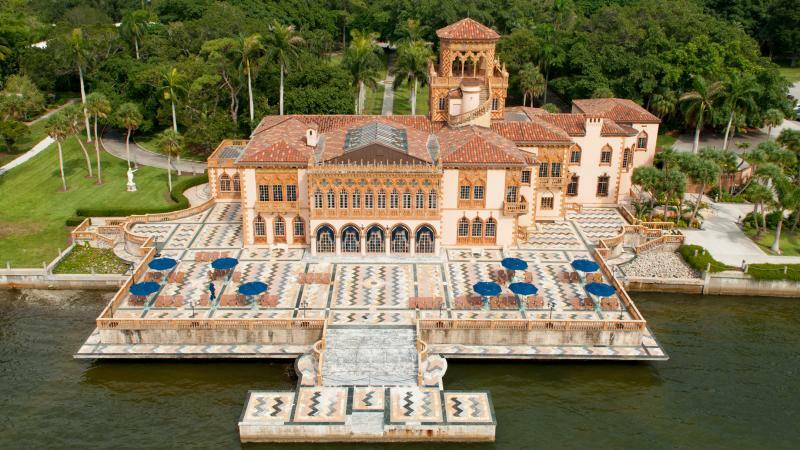 Join WGCU On the Road on Tuesday, April 16 for a private docent-led tour of Ca’ d’Zan, the Ringling’s 56-room mansion on Sarasota Bay. John Ringling was one of the five brothers who owned and operated the circus called “The Greatest Show on Earth.” His success with the circus and entrepreneurial skills helped to make him, in the Roaring Twenties, one of the richest men in America, with an estimated worth of nearly $200 million. Ringling and his wife, Mable, purchased 20 acres of waterfront property in Sarasota in 1911. A few years later they decided to build a house and began planning. Construction began in 1924 and was completed two years later at a then-staggering cost of $1.5 million. Five stories tall, the 36,000 square foot mansion named Ca’ d’Zan – or “House of John” in the dialect of Venice, Italy – has 41 rooms and 15 bathrooms. The Ringlings were avid collectors of art. After both John and Mable died, the property was not maintained well. But its profile began to rise with the first art museum director in 1948, who used Ringling memorabilia to open a circus museum on the property and spearheaded the building of a separate theater. Hard times came again until years of negotiation resulted in an agreement in 2000 with the state, Florida State University and a museum board to raise money for the property’s restoration. Eventually, with public support, more than $100 million was spent on what is now a magnificent example of a Gilded Age estate with multiple buildings and gardens. The Ringling, the State Art Museum of Florida, now is home to one of the preeminent art and cultural collections in the United States. Included on the is lunch on site at The Muse, with self-guided access to the Circus Museum, the Museum of Art and the Bayfront Gardens. The trip also includes charter bus transportation, taxes and gratuities. The trip is available by $150 donation each to WGCU. Tour-goers will leave WGCU at 9 a.m. and arrive back at about 5:45 p.m. The reservation deadline is April 11. For more information, go to wgcu.org/events.